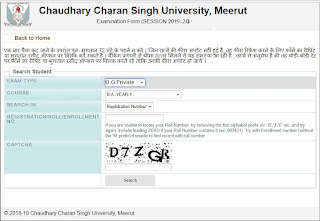 Online Registration for B.A. Private 1st Year , 2nd Year 2019 , M.A. - 1st Year , 2nd Year 2019 May Be Strarted Last Weak of January 2019 . CCS University UG/PG (B.A./M.A.) Private Course Online Registration form Will Available on the official Website of CCS University - http://mains.ccsuweb.in . Last Date of Submit Registration form to Collage. After 2 days of Online Registration Date. Eligibility for B.A. Private - Candidate Must Passed 10+2 Examination From a recognized Board of Any State . Eligibility for M.A. Private - Candidate Must Graduation Degree From a recognized University of India. 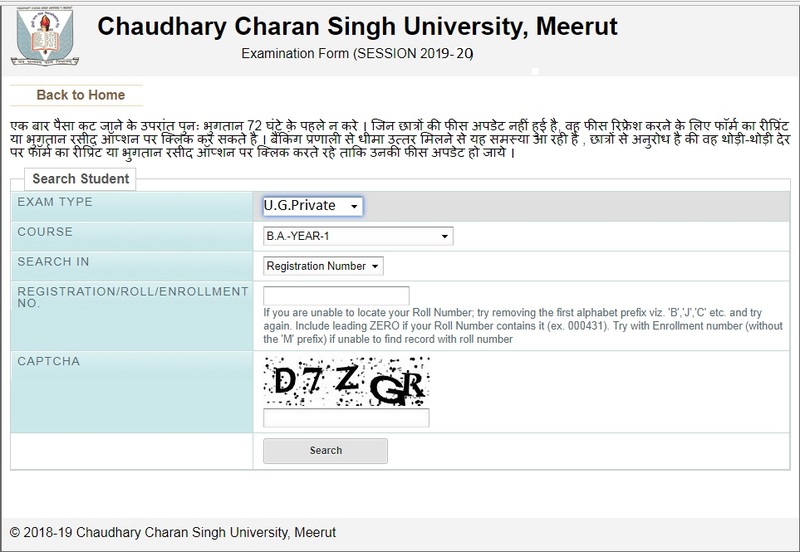 First of all Visit official website of Choudhary Charan Singh University Meerut http://mains.ccsuweb.in . Now lick on the link which you want to online registration like B.A. - 1st Year , 2nd Year , 3rd Year or M.A. 1st Year , 2nd Year Etc. Step - 2 : Pay Registration Fee. After Complete Registration Pay Registration Through Online Payment Mode. Candidate Can Pay Online Registration Fee Through Official Website of CCS University http://mains.ccsuweb.in . Just Open CCS University Main Website , On the Home Page of CCS University Website You Can Find Link to Pay Registration Fee . After Paying Registration Fee , Select Your Collage Where you want to take Admission. Next Step is To Submit Your Registration Form Hard Copy With All Required Document Copy Along With Registration Form in Your Collage Which You Locked During Online Registration.